We believe in the dignity of the human being and that the self esteem of the child should have priority. Each member of our school community has rights, along with those rights comes responsibilities. Ultimately individuals should develop self-discipline and the skills and strategies to make responsible, healthy and informed choices in a safe environment. Students are taught the expected behaviours. Students are engaged in lessons and shown videos of their peers modelling the expected behaviours. The language of the school expectations are embedded in classroom programs. Students are encouraged, praised and rewarded when they follow the school expectations. Rewards can be in the form of class points, stickers, golden tickets, reward charts, time at preferred activities. Stickers can be earned when students are on the playground and ‘caught being good’ by the teacher on duty. 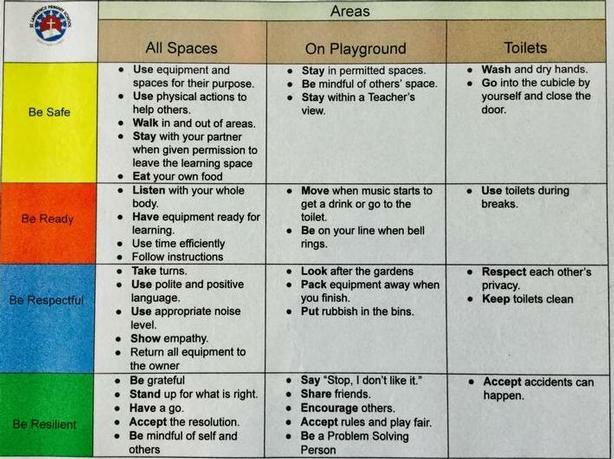 The focus for each ‘caught being good’ can be found on our behaviour matrix. We believe that by helping students practise good behaviour, we will build a school community where all students have an environment where they can succeed and grow. At St Lawrence Primary School we value positive and inclusive relationships where we learn to love ourselves, others and God. We believe we should give back to our community by striving to be safe, ready, respectful and resilient.